French President Emmanuel Macron was elected with a clear mandate to reform the French economy, and he has not hesitated to target politically sensitive institutions such as the national railway. But if Macron acquiesces to ongoing protests by France's unions, the rest of his reform agenda will become vulnerable. French President Emmanuel Macron received plenty of praise in the international media for his recent speeches in Washington, DC, and Brussels. But for the French, what really matters is Macron’s management of domestic problems, of which there are many, not least rolling strikes by railway workers across the country. Until the end of June, employees of the French state-owned railway company SNCF plan to strike for two out of every five days to oppose the Macron government’s planned reforms to the company. But the reforms are sorely needed. The SNCF’s operating costs are 30% higher than those of comparable railway systems in neighboring countries, and its performance is poorer. The SNCF’s higher operating costs stem partly from flawed, politically motivated investment decisions made in the past. For example, there has been undue emphasis on expanding high-speed-rail networks at the expense of maintaining existing tracks that are still widely used. But the company also suffers from obsolete and costly labor arrangements, which allow train drivers to retire at the age of 52, even though they are no longer subjected to the life-shortening rigors of operating coal-fired steam engines. As it happens, the life expectancy among SNCF drivers has increased substantially since these pension regulations were put in place in 1920. Moreover, SNCF employees and their family members have access to free travel on SNCF trains. This is one reason why the French railway system brings in just €10 billion ($12 billion) per year, even though it costs €24 billion annually to operate. The difference is essentially financed by the federal government and the regions, at a cost of some €3 billion in additional public debt each year. Given its drain on public budgets and its deteriorating performance and reliability, the SNCF is an obvious target for reform. And to that end, Macron has proposed a strategy to shore up the French railway system for the long term. Notably, one thing he has not proposed is any change to current SNCF workers’ employment status or benefits. Instead, Macron’s government has introduced changes that will affect only those employed by the SNCF after January 1, 2020. For them, his program does imply an end to lifelong job security, and a shift to a more modern, flexible employment arrangement. There will also have to be a re-evaluation of the specific constraints on SNCF workers and supervisors, many of which have not been updated since 1920. And newer employees will need to be incorporated into the French general health-insurance and pension systems. Beyond that, Macron wants to open up the railway system to allow new operators to compete against the SNCF. Similar reforms have reduced operating costs and increased the overall supply of trains by 32% in Germany, 30% in the United Kingdom, and 53% in Sweden. In Italy and Sweden, more railway competition has reduced ticket prices by 15%.And, in Germany, competition lowered the government’s expenses by 20%. Each kilometer of regional traffic now costs the state-owned railway operator, Deutsche Bahn, €15, compared to €23 for the SNCF. At the same time, liberalization of the railway sector promises to improve the quality of service, both in terms of travel time and punctuality. As matters stand, traveling from Marseille to Nice takes 25 minutes longer than it did 40 years ago; and, on average, 22% of French inter-city trains, along with 18-25% of high-speed trains, suffer delays, compared to just 10% of Deutsche Bahn trains. Given this dismal state of affairs, it is worth asking why French railway unions are staging such a large-scale protest against reforms that would only affect new recruits in the future. In fact, what looks like a unified strike movement actually comprises two major unions with different demands and motivations. 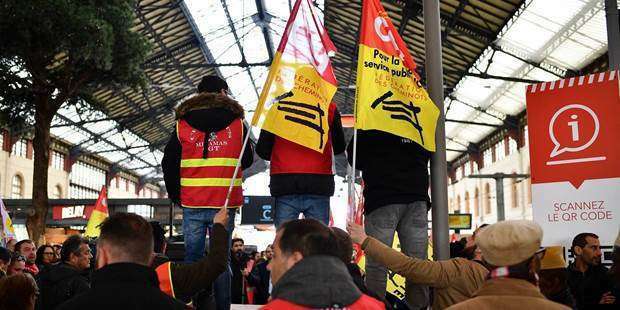 On one hand, there is the French Democratic Confederation of Labor (CFDT), which is open to dialogue with the government, but wants more employment and social-security guarantees for SNCF workers who will be hired by new operators after the system is opened up. On the other hand, there is the more radical General Confederation of Labor (CGT), which insists on maintaining the status quo. Its reasons are twofold. First, the SNCF is a CGT stronghold, and to allow different contractual arrangements for new recruits would weaken the union’s influence at the national level. Second, the CGT wants to use this strike as a starting point for derailing Macron’s entire reform agenda. But Macron was elected with a clear mandate to overhaul the French economy. Though he has proved flexible on the timing and method of introducing competition, he will likely defend his red lines, particularly those relating to new SNCF recruits as of 2020. After all, he knows what the CGT knows: that his railway policy could make or break his credibility as a reformer. Philippe Aghion is a professor at the Collège de France and at the London School of Economics, and a fellow of the Econometric Society and of the American Academy of Arts and Sciences. Benedicte Berner is a lecturer at Sciences Po in Paris, chair of Civil Rights Defenders, and an associate at Harvard University’s Davis Center for Russian and Eurasian Studies.